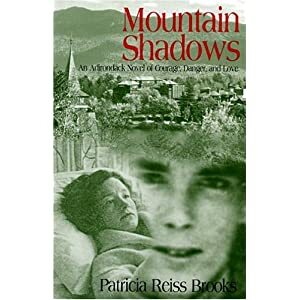 Mountain Shadows is an unusual novel in that the subject matter is one not usually dealt with in most historical novels. The story follows the life of Joe Devlin who makes a dangerous snowshoe trek through the mountains in winter to reach his young wife who is “curing” in a cabin in Saranac Lake. Apparently, it was a common practice for families to send loved ones to spend months, sometimes years curing or receiving care for the dreadful disease of tuberculosis. Patients were often set out on patios for hours at a time and sometimes over night if a particularly difficult case was being treated. Many would die, away from families and friends, hoping for the cure that would allow them to return to loved ones and lead a normal life. While some seemed to improve, others didn’t. This story follows the adventures of Joe and Alice. Joe is an unusual case in that he follows his young wife to Saranac Lake to be with her and visit with her during her months of curing. However, it is costly to provide for Alice’s care and he finds himself drawn into illegal bootlegging as a way to make the extra money needed for Alice’s expensive cure. Joe is able to see his wife for only a few hours each week and soon finds loneliness a constant companion. Unable to kiss for fear of the disease spreading to Joe, the young lovers must content themselves with talking. A definite strain on their new marriage, but determined to win the fight against the terrible disease, they keep on until they reach the end. I found this book to be really memorable. The characters were not superhuman, but real people with real emotional struggles and character flaws. I was able to relate to the frustrations and fears that Joe had and with Alice’s desperation to be free of her dreadful disease. I found the supporting characters such as Alice’s room mates to be interesting too. The two sisters who cared for the girls at the home were memorable and quirky at the same time. While I enjoyed this book, I wouldn’t say it falls into the same category as most Christian fiction in that God is mentioned, but is not a present being throughout the lives of the characters. I wouldn’t categorize it as “Christian fiction” but it does follow the standard of little violence, foul language or immoral behaviour. A good, clean read. If you are looking for a book that is historical, memorable, entertaining and makes you feel – then pick up this book. It is not the usual historical romance and I believe you will be refreshingly surprised.